Following close on the heels of our wildly enjoyable and well attended sunset picnic and film screening we have another fun, super-casual, food-growing-related-stuff Sustainable Living Festival event coming up for you. The West Brunswick Community Garden and Food Forest welcomes one and all to a day of fun and festivities, food, weeding, digging, tours and workshops. Marvel at the magnificent garden! Talk with the tame gardeners! Witness composting wonders! Gaze at our gorgeous greenhouse! Frolic in the fascinating food forest rescued from ruin! Join the growing number of people growing their own food at home or with others in the community. Throughout the day we'd love to see you come down and say 'hi' have a wander about and a chat and a cuppa. COMPOST! I know it's exciting right? 12.00pm - Dr Chris Williams (Melbourne Uni) will share his thoughts on multi-functional perennial veggies, heat tolerant food plants and might event show us how to propagate sweet potatoes. 1.00pm - Karen Sutherland (Edible Eden Design) will do a walking tour of the food forest talking about what we're working towards, how it's been going, the plants we've got growing. 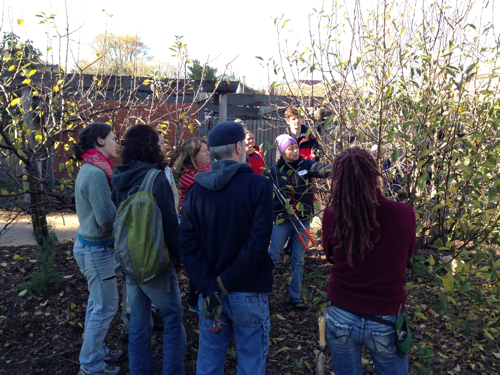 Our winter Food Forest tour . We have leaves now. 2.00pm - Community Garden tour - we'll have a stroll around the community garden and chat about how it works, how we got here and how you can get involved. Yes, it is our monthly working bee that day and we do, of course, have stuff to do. You can help weeding, watering, composting and more. Lunch will be the usual bring-a-plate affair from about 1pm. Remember you also need to bring a hat, gloves, sturdy footwear and a good joke.